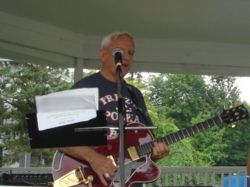 Frank and Fred are shown here during FPB's gig for the Jadwick Party in Utica, NY on September 7, 2008. 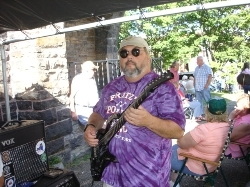 Tom and his Gibson on September 6, 2008 in Pulaski, NY at the Salmon River Festival. 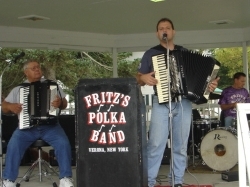 Fred, Fritz, and George are shown here during FPB's gig at the 2008 Salmon River Festival in Pulaski, NY. 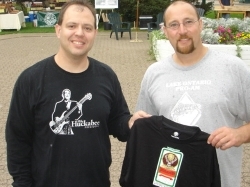 Fritz presents a Jagermeister t-shirt to Brian, prior to FPB's gig at the Salmon River Festival on September 6, 2008. Brian helped coordinate FPB's gig (Thanks, Brian!). 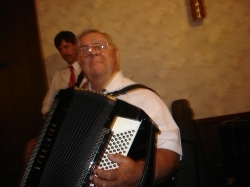 Gabe is pictured here with his Parker during FPB's second set of August 31, 2008 in Port Henry, NY. Is that Frank doing a drum solo? 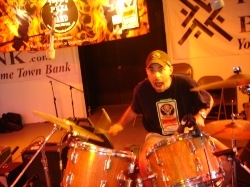 Nope....he's just testing out special guest drummer, Mike Farraino's drums prior to FPB's second set at the Labor Day Celebration in Port Henry, NY on August 31, 2008. 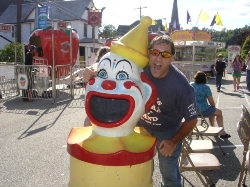 Special guest drummer, Mike Farraino literally clowns around during FPB's intermission on August 31st in Port Henry, NY. 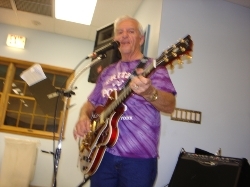 Tom is shown here singing/yodeling 'Chime Bells' during the encore on August 30, 2008 at the Mohawk Correctional Facility Pavilion in Rome, NY. 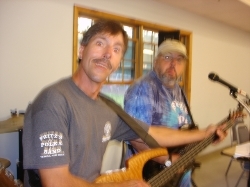 Frank and Gabe ham it up for the camera during FPB's gig on August 30th in Rome, NY. 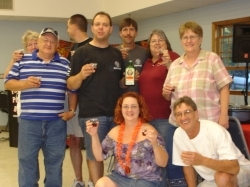 Rick, Fritz, and Frank tip some Jagermeister punch with new fans on August 30, 2008 at the Mohawk Correctional Facility Pavilion. 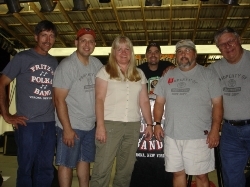 Frank, Fritz, Rick, Gabe, and Fred are shown here with a friend of theirs for many years, Kathleen, after FPB's gig at the Schaghticoke Fair in Schaghticoke, NY wrapped up on August 28th. 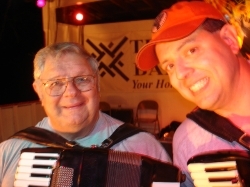 Fred and Fritz pose for a picture, prior to FPB's last tune of the evening on August 28, 2008 at the Schaghticoke Fair. 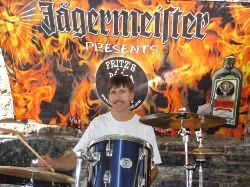 Rick hams it up for the camera during FPB's second set of August 28th at the Schaghticoke Fair. 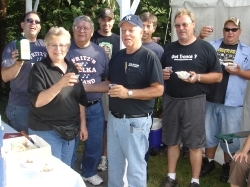 Fritz, Fred, Rick, and Frank tip some Jagermeister punch with Rosemary and Jim Staats, of Big House Entertainment, as well as John Lloyd and Ray, from Lloyd Sound, on August 28th in Schaghticoke, NY. 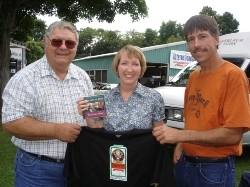 Fred and Frank present Rensselaer County Exectutive, Kathy Jimino with a Jagermeister t-shirt and FPB CD, prior to FPB's first set at the Schaghticoke Fair on August 28th.